Bringing up the possibility of a Misfits of Science: Season 2 comic didn’t really fit in the body of this post, so here it is in the title. 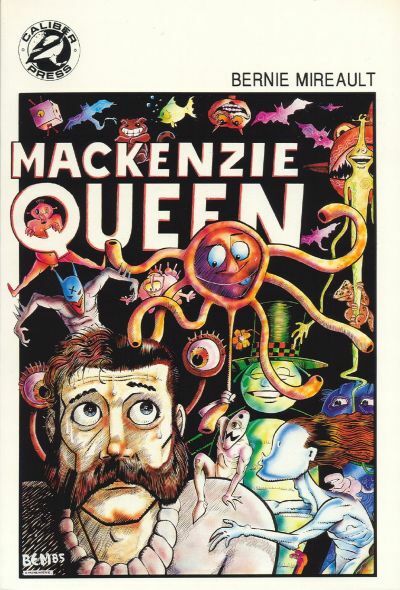 So when I was talking about the black and white boom books a while back (1 2 3) there’s one I totally forgot about and was reminded of when Zack Soto brought it up on his Twitter: MacKenzie Queen ! Yeah, that’s the cover of the trade instead of one of the issues of the actual series, because if I’m going to “borrow” a pic from the Grand Comics Database, let it at least this time be one that I scanned for that site myself. Anyway, I’ve written here before about MacKenzie Queen , mostly about the fact that it took me what seemed like forever to track down the last issue of the series. In fact, I found it after I bought the trade, because it figures. And you should go to that link for the ultimate punchline about the whole MacKenzie Queen #5 thing. I definitely did want to point out this comic, even if it’s a bit after the fact of my black and white funnybook discussion, because this was the first time I was exposed to the work of Bernie Mireault, and just loved it to pieces. Beautifully detailed art delineating crazy magic and aliens and even music, with a great sense of humor…this was right up my alley. The Jam is a later series of his that’s just as great, and even just typing out that name makes me want to pull those out of the boxes and give ’em a reread. …Man, if only I had time to reread all the comics I want to reread. So, in conclusion: MacKenzie Queen and The Jam …two more positive results from the black and white boom of the 1980s. ASK FOR THEM BY NAME. In other news, the long-running Wild Cards anthology series that took comic book superheroes and turned ’em into prose (and then people would occasionally turn them back into comic books, for some reason) is apparently just about to get a live-action adaptation, apparently. Frankly, I’m surprised it took this long, kinda sorta, especially now when people are scrambling for superhero stuff to turn into movies and hopefully get some trickle-down from that enormous pile of Avengers movie bucks. I’m only “kinda” surprised because, as has been brought up in the occasional discussion I’d get into friends with this, the sheer number of different writers and characters they’ve created for the series might complicate any media adaptation deals, though I have zero idea what kind of agreements were in place for this very thing. And it might have been the cost…a superhero TV show means lots of special effects, and while those are probably cheaper to do now than they ever have been, it still ain’t free, and multiply the number of different effects they’d have to work out by the number of characters that could be involved. I mean, there are ways to work around this, of course. On the other hand, given that George R.R. Martin was one of the instigators of this particular book project, I’m not surprised someone finally pushed this project forward. Seems like I remember a long time ago, reading in Comics Scene , that this was a possible Disney project at one point, maybe? But whatever. I do look forward to it, as a Wild Cards fan since that first paperback came out way back in 1986 (thirty years? good gravy…and I know it has a 1987 copyright, but I’m about 98% certain it came out in late ’86). I’m trying not to get my hopes too far up, given my reaction to another adaptation of something I greatly enjoyed, but if they can sell me on a live-action version of The Great and Powerful Turtle, I think I’ll be okay with it. And speaking of comic book TV adaptations…is Dreadstar still in the works? Oh Lordy I hope so. It was my freshman year of college, and I was flying home from Seattle to Los Angeles for the Christmas break. There was an inversion layer, the whole Puget Sound area was densely fogbound, and flights in and out were many hours late. I’d finished off whatever book it was I’d brought to read, so I hit the airport bookstore looking for something. There, on the new release shelf for sf and fantasy, was Wild Cards. I recognized several of the authors as people who write stories I like, so I got it. I had time to read the first 3-4 stories before boarding began, most of the rest on the flight, and finished it at home the next day. So, yeah, it showed up on stands by December 1986.